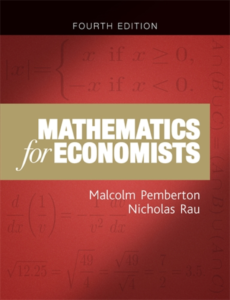 Many of you will have downloaded the CORE Leibniz supplements created by Malcolm Pemberton and Nicholas Rau, authors of Mathematics for Economists: An Introductory Textbook. Now, thanks to Manchester University Press, CORE readers can purchase the 4th edition (published in 2016, right) at a special 30% discount by quoting discount code ASFLYQ6. To place an order if you live in North America, please click here. For orders if you live in the rest of the world, please click here instead. When you click on the links you will be offered the book at full price. Select the book, add it to your shopping cart, and type ASFLYQ6 in the “Promotion code” box when you confirm your order. That’s all there is to it: the discount will automatically be applied before you pay. Both students and teachers have told us in the past that textbook prices are too high. We hope this makes a difference.